Traditionally, every week we bring you a list of the top performances of Nigerians who are currently playing abroad. #1. This week's number one is former international small forward Thanasis Antetokounmpo (199-92, currently plays in Euroleague). He led his Greek team Panathinaikos to an easy victory against the 14th-ranked Gran Canaria (6-19) 99-80 in the Euroleague last Thursday. Antetokounmpo scored 16 points, had 4 rebounds and made 2 blocks. Panathinaikos Superfoods Athens (12-13) is placed tenth in the Euroleague. It was his team's third consecutive victory in a row. This season Antetokounmpo averages: 5.2ppg, 1.8rpg, 2FGP: 75.0%(42-56), 3FGP: 33.3% and FT: 41.7%. He has a dual citizenship: Nigerian and Greek. Antetokounmpo played for the Nigerian senior national team three years ago. #2. Second place goes to former international power forward Suleiman Braimoh (203-89, college: Rice, currently plays in Israel). He led Hapoel Eilat to a victory over one of league's weakest teams Ironi Nahariya (5-14) 93-75 in the Israeli Winner League last Thursday. Braimoh was MVP of the game. He recorded 28 points (!!!) and grabbed 4 rebounds in 29 minutes. Hapoel Eilat (13-7) is placed fourth in the Winner League. There are only two games left until the end of the Regular Season. So now every game will be critical. Braimoh has individually a very good year with high stats. He averages: 16.2ppg, 5.6rpg, 1.8apg, 1.4spg, 2FGP: 58.8%(77-131), 3FGP: 41.7% and FT: 74.1% in 16 games he played so far. Braimoh is another player who holds two passports: Nigerian and American. He played for the Nigerian national team in 2016. #3. The Nigerian player who performed third best last week abroad was an international shooting guard Ikenna Mbamalu (191-91, college: La-Lafayette, currently plays in Chile). Mbamalu was the main contributor in Aleman's victory against the second-ranked Deportivo Valdivia (20-12) 77-73 in the Chilean Liga Nacional on Sunday night. He was the best player in that game. Mbamalu recorded a double-double by scoring 25 points and getting 14 rebounds. It was the game of the round between two top 3 ranked teams in group Conferencia Sur. CD Aleman Puerto Varas Concepcion (18-14) is placed third in Conferencia Sur. It was his team's fifth consecutive victory in a row. It's Mbamalu's first season with the team. This year he has very high stats. Mbamalu averages: 22.5ppg, 6.3rpg, 3.0apg, 2FGP: 56.0%(187-334), 3FGP: 32.8% and FT: 78.6%. He has both American and Nigerian nationalities. Mbamalu is also a member of the Nigerian senior national team. He used to play for Lagos Warriors in Nigerian league. #4. Guard Ike Iroegbu (188-95, college: Washington St., currently plays in Lithuania) could not help Lietkabelis (14-9) in their last game. Despite Iroegbu's very good performance Lietkabelis lost 74-89 at home to the lower-ranked (#6) Juventus. He was the top scorer with 20 points. Iroegbu also added 5 rebounds and dished 3 assists in 23 minutes; not bad, considering it's only his second season in pro basketball.They ended the series of four consecutive victories. Iroegbu has relatively good stats this year: 14.8ppg, 3.8rpg and 4.0apg in four games. He is also Nigerian national team player. #5. International center Tonye Jekiri (213-94, college: Miami, FL, currently plays in Turkey) contributed to Gaziantep's victory against the closely-ranked Turk Telekom (10-8) 85-79 in the Turkish BSL last Saturday. Jekiri recorded a double-double by scoring 13 points and getting the same number of rebounds. He also added 3 assists. Gaziantep Basketbol (11-7) is placed fourth in the BSL. It was his team's third consecutive victory in a row. This season Jekiri has relatively solid stats: 12.4ppg, 10.7rpg, 1.8apg and 1.1spg. He plays currently for the Nigerian national team. #6. Power forward Talib Zanna (206-90, college: Pittsburgh, currently plays in Israel) was not able to help Ironi Nes-Ziona (8-12) in their last game. Despite Zanna's very good performance Ironi Nes-Ziona lost 82-87 on the road to the second-ranked Maccabi T-A. He had a double-double by scoring 19 points and getting 12 rebounds. Zanna also added and 3 steals in 34 minutes. It was Ironi Nes-Ziona's fourth consecutive loss in a row. There are only two games left until the end of the Regular Season. So now every game is very crucial. Zanna has reliable stats this year: 12.0ppg, 7.3rpg and 1.6spg in seven games. He is an international player who is currently on the senior Nigerian National Team roster. #7. An experienced international center Jeleel Akindele (216-83, agency: BeoBasket, college: Chicago St., currently plays in Mexico) contributed to a Fuerza Regia's victory against the fourth-ranked Laguneros (19-20) 88-77 in the Mexican LNBP (second division) in Sunday night's game. Akindele scored 13 points, grabbed 8 rebounds and dished 6 assists. Fuerza Regia Monterrey (31-9) is placed first in North group. This season Akindele has very high stats. He averages: 17.4ppg, 8.7rpg and 2.8apg. Akindele is also Nigerian national team player. #8. Guard Michael Efevberha (193-84, agency: Octagon Europe, college: CS Northridge, currently plays in Lebanon) helped Homentmen win their game against one of league's weakest teams Al Moutahed (3-8) 71-66 in the Lebanese LBL on Saturday night. He was the top player that evening. Efevberha scored 18 points, grabbed 6 rebounds and dished 3 assists (was perfect 8-for-8 from the free throw line). Homentmen Beirut (10-2) is placed first in the LBL. It was his team's fourth consecutive victory in a row. They will play only one more game in the Regular Season. And now that game is quite important. This season Efevberha has very high stats. He averages: 20.8ppg, 4.5rpg, 1.9apg and 1.5spg. Efevberha also holds two passports: Nigerian and American. He plays currently for the Nigerian national team. #9. Former international forward Abdullahi Kuso (206-84, college: Tallahassee CC, currently plays in Japan) was the major contributor in Gunma's victory against the second-ranked Shimane Magic (32-13) 86-70 in the Japanese B2 League last Saturday. Kuso recorded a double-double by scoring 19 points and getting 12 rebounds. He also added 4 assists (was perfect 5-for-5 from the free throw line). It was the game of the round between two top 3 ranked teams in group East. Gunma Crane Thunders (33-12) are placed first. It was his team's fifth consecutive victory in a row. This season Kuso has very high stats. He averages: 16.0ppg, 10.7rpg, 3.3apg, 1.9bpg and 1.5spg. Kuso used to play for the Nigerian national team twelve years ago. #10. Forward Al-Farouq Aminu (206-90, college: Wake Forest, currently plays in NBA) helped Portland Trail Blazers win their game against the Charlotte Hornets (29-35) 118-108 in the NBA on Sunday night. He scored 14 points, grabbed 6 rebounds and dished 4 assists in 31 minutes. The Portland Trail Blazers have 39-26 record this season. Aminu is one of the most experienced players in a team as it's his fourth year in Trail Blazers' roster. Aminu's stats this season are: 9.4ppg, 7.6rpg and 1.4apg in 65 games. He holds both American and Nigerian passports. Despite Aminu played previously for the USA U19 national team, he is also an international player who is currently on the senior Nigerian National Team roster. #11. International point guard Michael Umeh (188-84, college: UNLV, currently plays in Poland) helped Twarde Pierniki edge the 13th-ranked HydroTruck Radom 87-85 in the Polish EBL in Sunday night's game. Umeh scored 10 points and grabbed 7 rebounds. He averaged so far 13.9ppg, 2.6rpg and 2.9apg. Umeh holds both American and Nigerian passports. He plays currently for the Nigerian national team. #12. Former international forward Melvin Ejim (201-91, college: Iowa St., currently plays in VTB United League) was not able to secure a victory for Unics Kazan in their game against Astana in the VTB United League. He scored 6 points, had 7 rebounds and made 2 blocks in 28 minutes. His team was edged 98-95. This year Ejim's overall stats are: 7.2ppg and 6.2rpg in 10 games. He used to play for the Nigerian national team back in 2012. #13. Former international power forward Ike Ofoegbu (205-84, college: SMU, currently plays in Mexico) helped Aaguacateros edge the second-ranked Soles 82-80 in the Mexican LNBP (second division) in Thursday night's game. He recorded 20 points, 5 rebounds and 3 assists in 30 minutes. Ofoegbu's stats this year are: 13.3ppg, 4.0rpg and 1.5apg in four games. He holds both American and Nigerian passports. Ofoegbu used to play for the Nigerian national team three years ago. #14. International swingman Stan Okoye (198-91, college: VMI, currently plays in Spain) helped Zaragoza win their n overtime game against the closely-ranked CB Canarias 102-93 in the Spanish Liga Endesa last Sunday. He scored 8 points. Okoye averaged so far 13.6ppg and 4.9rpg. He holds both American and Nigerian passports. Okoye plays currently for the Nigerian national team. #15. International center Ekenechukwu Ibekwe (207-85, college: Maryland, currently plays in France) helped Levallois win their game against the fifth-ranked Chalons-Reims 83-78 in the French Jeep ELITE ProA in Friday night's game. He scored 8 points and grabbed 5 rebounds. Ibekwe's total stats this season are: 7.0ppg, 4.1rpg and 1.1spg. He holds both American and Nigerian passports. Ibekwe is also in the roster of the Nigerian national team. #1. Giannis Antetokounmpo (211-G/F-94, agency: Octagon Europe, currently plays in NBA) could not help the Milwaukee Bucks (49-16) in their last game. Despite his very good performance the Milwaukee Bucks (49-16) lost 111-115 on the road to the Utah Jazz. Antetokounmpo had a double-double by scoring 43 points and getting 14 rebounds. He also added 8 assists in 32 minutes. It's Antetokounmpo's sixth season with the team. Antetokounmpo has individually a very good year with high stats. He averages: 27.1ppg, 12.7rpg, 6.0apg, 1.5bpg and 1.4spg in 60 games he played so far. Antetokounmpo has a dual citizenship: Greek and Nigerian. #2. Michael Ojo (216-C-93, college: Florida St., currently plays in ABA League) was the major contributor in a 2-point Crvena Zvezda's victory against the closely-ranked Partizan (13-7) 70-68 in a derby game in the ABA League on Sunday night. Ojo scored 16 points and grabbed 9 rebounds in 31 minutes; quite an impressive performance considering it's only his second season in pro basketball. It was the game of the round between two top 4 ranked teams. Crvena Zvezda MTS Beograd (19-1) is placed first in the ABA League. It was his team's third consecutive victory in a row. There are only two games left until the end of the ABA League Regular Season. So now every game will be critical. It's Ojo's first year with the team. This season Ojo's overall stats are: 8.6ppg and 6.1rpg in 20 games. Worth to mention he played also at Eurobasket Summer League, which helped him get the job in pro basketball. #3. Ike Joseph Udanoh (203-PF-89, college: Wayne St., MI, currently plays in Italy) was not able to help Sidigas AV (12-8) in their last game on Sunday. Despite his very good performance Sidigas AV was badly defeated 97-79 in Trento by the lower-ranked Dolomiti En. TR (#10). Udanoh was the second best scorer with 17 points. He also added 7 rebounds and dished 6 assists. It was his first game for Sidigas AV this season. Udanoh is another player who holds two passports: Nigerian and American. #4. Chima Moneke (198-F-95, college: Cal-Davis, currently plays in France) was not able to secure a victory for Denain Voltaire (7-13) in their last game. Despite his very good performance Denain Voltaire lost 70-78 in Saint Chamond to the much higher-ranked (#5) Saint Chamond. Moneke had a double-double by scoring 24 points and getting 11 rebounds. He also added 4 assists and 4 steals in 32 minutes. It was Denain Voltaire's third consecutive loss in a row. Moneke's stats this year are: 12.2ppg, 6.0rpg, 1.4apg and 1.5spg in 13 games. #5. David Kadiri (200-F-95, college: Buffalo, currently plays in Serbia) couldn't help Sloboda Uzice (11-13) in their last game. Despite Kadiri's very good performance Sloboda Uzice was edged 94-92 at home by the lower-ranked (#13) Spartak. He had a double-double by scoring 24 points and getting 13 rebounds in 37 minutes. It was Sloboda Uzice's fifth consecutive loss in a row. There are only two games left until the end of the Regular Season. This year Kadiri's overall stats are: 10.0ppg and 5.0rpg in 24 games. He has both American and Nigerian nationalities. #6. Chukwudiebere Maduabum (206-F-91, currently plays in Japan) couldn't help Yamagata (17-28) in their last game. Despite Maduabum's very good performance the fifth-placed Yamagata were badly defeated 80-62 in Hyogo by the higher-ranked (#3) Nishinomiya Storks in the East group. He had a double-double by scoring 22 points and getting 16 rebounds. Maduabum also added 3 assists and 2 blocks in 31 minutes. His stats this year are: 13.9ppg, 9.2rpg, 1.6apg and 2.6bpg in 39 games. #7. Experienced Aleksey Adediran (201-C-82, college: Binghamton, currently plays in Ukraine) led Mykolaiv to a victory over the league outsider Cherkasy 80-73 in the Ukrainian Superleague on Sunday night. Adediran was the top player that evening. He recorded a double-double by scoring 19 points and getting 13 rebounds. Adediran also added and 3 steals. He averaged so far 10.2ppg and 6.3rpg. Adediran also holds two passports: Nigerian and Russian. #8. Micheal Eric (210-C-88, college: Temple, currently plays in Euroleague) couldn't help Darussafaka (3-22) in their last game on Thursday. Despite Eric's good performance the bottom-ranked Darussafaka was crushed 91-67 on their home court in Istanbul by the higher-ranked Panathinaikos (#10). He recorded 11 points, 4 rebounds and 3 blocks. Eric averaged so far 11.5ppg and 5.1rpg. #9. Abdul-Malik Abu (203-F-95, college: NC State, currently plays in Croatia) contributed to a KK Vrijednosnice Osijek's victory against the league outsider Bosco 71-66 in the Croatian Premijer Liga on Saturday night. He scored 7 points, had 13 rebounds and dished 4 assists in 30 minutes. Abu's stats this year are: 14.5ppg, 9.5rpg and 1.7apg in 15 games. #10. Christian Nwogbo (190-F-91, also represented by Octagon Europe, college: Cedarville, currently plays in France) was the main contributor in a SPO Rouen's victory against the closely-ranked Gries/Oberhoffen 98-87 in the French ProB (second division) in Friday night's game. He was the top player that evening. Nwogbo recorded 21 points and grabbed 4 rebounds. He averaged so far 11.3ppg, 5.4rpg, 1.1apg and 1.2spg. Nwogbo holds both American and Nigerian passports. AEK Athens (A1) signed 30-year old Nigerian power forward Trevor Mbakwe (207-111kg-89, college: Minnesota, agency: Pensack Sports). He is a dual citizen owning also American passport. Mbakwe just played at Osaka Evessa in Japanese B League. He managed to play in three leagues in two countries this year. In 19 B League games he had 9.1ppg, 9.0rpg and 2.4apg. Mbakwe also spent pre-season at EnBW Ludwigsburg (BBL) in German league where in 5 B League games he recorded 9.2ppg, 7.4rpg and 1.0spg. He also played 4 games in Basketball Champions League where he averaged 5.5ppg, 5.5rpg and 1.5apg. Mbakwe has tried to make it to the NBA and played in the NBA Pro Summer League in 2014. The list of the past achievements is quite long as among others he won German Bundesliga championship title in 2015. Mbakwe was also voted Eurobasket.com All-Italian SerieA Center of the Year back in 2014. He represented Nigeria at the World University Games in Shenzhen (China) eight years ago. But his stats at that event were not that impressive as he did not score anything. Mbakwe is quite experienced player. He has played also professionally in Israel (Maccabi Fox Tel-Aviv), Russia (Zenit), Spain (Unicaja Malaga), Italy (Virtus Roma and Fiat Torino) and Germany (Brose Baskets). Mbakwe attended University of Minnesota until 2013 and it is his sixth season as a professional player. Here is the weekly review of the top performing Nigerian players, who play currently abroad. #1. This week's number one is an experienced international guard Michael Efevberha (193-84, agency: Octagon Europe, college: CS Northridge, currently plays in Lebanon). He led Homentmen to a victory over the closely-ranked Beirut Club (12-4) 98-80 in a derby game in the Lebanese LBL in Monday night's game. Efevberha was MVP of the game. He recorded 30 points (!!! ), 8 rebounds, 3 assists and made 2 blocks (made all of his six free throws) in 34 minutes on the court. It was the game of the round between two top 4 ranked teams. Homentmen Beirut (12-4) is placed second in the LBL. Efevberha has individually a very good year with high stats. He averages: 19.7ppg, 4.1rpg, 2.5apg, 1.7spg, 2FGP: 49.7%, 3FGP: 41.2% and FT: 84.4% in 20 games he played so far. Efevberha has a dual citizenship: Nigerian and American. He is currently a member of the Nigerian senior national team. #2. 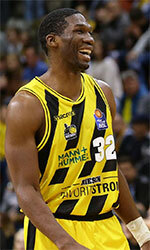 Second place goes to an international guard Ike Iroegbu (188-95, college: WSU, currently plays in Lithuania). He was the major contributor in Lietkabelis' victory against one of league's weakest teams Siauliai (6-25) crushing them 101-81 in the Lithuanian LKL on Thursday night. Iroegbu recorded 20 points, 6 rebounds and 4 assists in 28 minutes; quite an impressive performance considering it's only his second season in pro basketball. Panevezys Lietkabelis (20-11) is placed fourth in the LKL. It was his team's fourth consecutive victory in a row. Iroegbu has very impressive stats this year: 15.4ppg, 3.5rpg, 3.7apg, 2FGP: 54.7%, 3FGP: 45.5%(20-44) and FT: 70.5% in 12 games. He is in the roster of the Nigerian senior national team. #3. The Nigerian player who performed third best last week abroad was an international swingman Stan Okoye (198-91, college: VMI, currently plays in Spain). Okoye could not help Zaragoza (13-13) in their last game on Saturday. Despite his very good performance Zaragoza was defeated 91-86 at home by the leading FC Barcelona. Okoye recorded a double-double by scoring 20 points and getting 11 rebounds. Okoye has relatively good stats this season: 14.8ppg, 4.9rpg, 1.1apg, 2FGP: 48.1%, 3FGP: 42.8% and FT: 76.0%. He is another player who holds two passports: Nigerian and American. Okoye is also a member of the Nigerian senior national team. #4. Power forward Suleiman Braimoh (203-89, college: Rice, currently plays in Israel) was not able to help Hapoel Eilat (18-9) in their last game. Despite his very good performance Hapoel Eilat lost 92-99 on the road to the leading Maccabi T-A. Braimoh was the second best scorer with 16 points. He also added 7 rebounds and made 2 blocks in 27 minutes. They ended the series of four consecutive victories. It's Braimoh's first season with the team. Braimoh has very impressive stats this year: 15.9ppg, 5.3rpg, 1.7apg and 1.6spg in 23 games. He used to play for the Nigerian national team back in 2016. #5. International power forward Talib Zanna (206-90, college: Pittsburgh, currently plays in Israel) was not able to secure a victory for Ironi Nes-Ziona (12-15) in their last game. 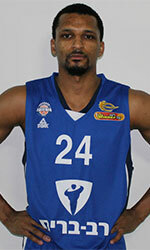 Despite his very good performance Ironi Nes-Ziona was crushed 100-73 in Jerusalem by the second-ranked Hapoel. Zanna was the top scorer with 18 points. He also added 8 rebounds in 32 minutes. It was Ironi Nes-Ziona's first loss after three consecutive victories. This year Zanna has relatively solid stats: 13.1ppg, 7.1rpg and 1.2spg in 14 games. He plays currently for the Nigerian national team. #6. Forward Abdullahi Kuso (206-84, college: Tallahassee CC, currently plays in Japan) contributed to an easy victory against the second-ranked Sendai 89ers (38-20) 80-64 in the Japanese B2 League last Saturday. He scored 20 points, had 7 rebounds, passed 3 assists and added 3 blocks in 40 minutes. It was the game of the round between two top 3 ranked teams in group East. Gunma Crane Thunders (42-16) are placed first. It was his team's sixth consecutive victory in a row. There are only two games left until the end of the Regular Season. So now every game will be critical. Kuso has very impressive stats this year: 16.0ppg, 10.9rpg, 3.2apg, 1.8bpg and 1.4spg in 57 games. He is a former international player as he played for the Nigerian senior team twelve years ago. #7. Former international power forward Gani Lawal (206-88, college: Georgia Tech, currently plays in Japan) couldn't help Shiga L-Stars (18-40) in their last game on Sunday. Despite Lawal's very good performance the fifth-placed Shiga L-Stars (18-40) were crushed 92-65 in Nagoya by the second-ranked Diamond Dolphins in the West group. He recorded a double-double by scoring 30 points and getting 12 rebounds. Lawal also added 2 blocks. There are only two games left until the end of the Regular Season. So now every game is very crucial. This season Lawal has very high stats. He averages: 21.0ppg, 12.2rpg, 1.6apg and 1.5bpg. Lawal has both American and Nigerian nationalities. He used to play for the Nigerian national team six years ago. #8. Forward Melvin Ejim (201-91, college: Iowa St., currently plays in VTB United League) contributed to a 2-point Unics Kazan's victory against the sixth-ranked Zenit (14-10) 74-72 in the VTB United League in Sunday night's game. Ejim scored 9 points in 18 minutes. Unics Kazan (19-5) is placed second in the VTB United League. It was his team's fifth consecutive victory in a row. There are only two games left until the end of the VTB United League Regular Season. This year Ejim's overall stats are: 7.7ppg and 5.9rpg in 15 games. He used to play for the Nigerian national team back in 2012. #9. International forward Al-Farouq Aminu (206-90, college: Wake Forest, currently plays in NBA) contributed to a Portland Trail Blazers' victory against the Oklahoma City Thunder (49-33) 104-99 in the NBA in Sunday night's game. Aminu recorded 10 points, 7 rebounds and 3 blocks (made all of his six free throws). The Portland Trail Blazers have a solid 53-29 record this season. It was his team's third consecutive victory in a row. Aminu is one of the most experienced players in a team as it's his fourth year in Trail Blazers' roster. He has reliable stats this season: 9.3ppg, 7.5rpg and 1.3apg. Aminu also holds two passports: Nigerian and American. Despite he played previously for the USA U19 national team, Aminu is currently in the Nigerian national team roster. #10. Center Tonye Jekiri (213-94, college: Miami, FL, currently plays in Turkey) couldn't help Gaziantep (14-10) in their game against Tofas (17-8) in the Turkish BSL. He scored 8 points and added 3 passes. Gaziantep was defeated 77-67 in Bursa by the higher-ranked Tofas (#3). There are only three games left until the end of the Regular Season. Jekiri's stats this season are: 12.5ppg, 10.8rpg, 2.3apg and 1.1spg. He is an international player who is currently on the senior Nigerian National Team roster. #11. International center Ekenechukwu Ibekwe (207-85, college: Maryland, currently plays in France) couldn't help Levallois in their game against Le Portel in the French Jeep ELITE ProA. Ibekwe scored 8 points. His team was defeated 83-78. Ibekwe's total stats this season are: 6.5ppg and 4.7rpg. He holds both American and Nigerian passports. Ibekwe plays currently for the Nigerian national team. #12. International guard Caleb Agada (193-94, agency: Blacktop Management, college: Ottawa, currently plays in Spain) couldn't help Melilla Baloncesto (18-13) in their last game. Despite his very good performance Melilla Baloncesto was edged 62-59 in Bilbao by the second-ranked RETAbet BB. Agada was the top scorer with 19 points. He also added 5 rebounds in 36 minutes. Agada's stats this year are: 11.8ppg, 6.4rpg, 2.1apg and 2.3spg in 28 games. Despite he played previously for the Canadian university national team, Agada is currently in the Nigerian national team roster. #13. Former international forward Daniel Ochefu (211-93, college: Villanova, currently plays in Spain) couldn't help Leche Rio Breogan in their game against Movil Estudiantes in the Spanish Liga Endesa. He scored 6 points and grabbed 5 rebounds in only 9 minutes. It was his first game for Leche Rio Breogan this season. His team was crushed by 33 points 95-62. Ochefu used to play for the Nigerian national team two years ago. #14. International guard Obi Emegano (190-93, college: ORU, currently plays in France) couldn't help one of league's weakest teams JDA Dijon in their game against Monaco in the French Jeep ELITE ProA. He cannot count Sunday's game as one of the best ones. Emegano scored only 3 points in 21 minutes. His team was edged 84-81. This year Emegano's total stats are: 7.6ppg, 2.3rpg and 1.1spg in 27 games. He plays currently for the Nigerian national team. #15. Former U22 international power forward Dinma Odiakosa (203-85, college: Illinois St., currently plays in France) couldn't help Sluc Nancy in their game against SPO Rouen in the French ProB (second division). Odiakosa scored 7 points and grabbed 7 rebounds. His team was defeated 82-68. Odiakosa has averaged so far 7.2ppg and 6.1rpg. He used to play for the Nigerian U22 national team fifteen years ago. #1. Giannis Antetokounmpo (211-G/F-94, agency: Octagon Europe, currently plays in NBA) was the major contributor in a Milwaukee Bucks' victory against the Detroit Pistons (41-41) crushing them 120-99 in the NBA last Wednesday. Antetokounmpo recorded a double-double by scoring 26 points and getting 12 rebounds. He also added 4 assists and 2 blocks. The Milwaukee Bucks have a solid 60-22 record this season. It's Antetokounmpo's sixth year with the team. Antetokounmpo has individually a very good year with high stats. He averages: 27.6ppg, 12.6rpg, 5.8apg, 1.5bpg and 1.2spg. Antetokounmpo has a dual citizenship: Greek and Nigerian. #2. Peter Olisemeka (204-C-91, currently plays in Bulgaria) led Academik Plovdiv to a victory over the closely-ranked Yambol (8-15) 90-82 in the Bulgarian NBL last Thursday. He was the best player in that game. Olisemeka scored 23 points and grabbed 9 rebounds in 22 minutes. Akademik Bultex 99 Plovdiv (12-11) is placed fourth in the NBL. His team will play only one more game in the Regular Season. And that game will be critical. It's Olisemeka's first season with the team. This year Olisemeka has relatively solid stats: 14.1ppg and 11.7rpg in 23 games he played so far. He is another player who holds two passports: Nigerian and Italian. #3. Moses Kingsley (208-F-94, college: Arkansas, currently plays in Belgium) could not help Antwerp Giants (20-5) in their last game on Saturday. Despite Kingsley's very good performance the league leader Antwerp Giants was edged 81-80 on the road by the second-ranked Oostende. He was the second best scorer with 17 points. Kingsley also added 4 rebounds. It's Kingsley's first season with the team. His overall stats this year are: 6.9ppg and 3.9rpg. Kingsley has both American and Nigerian nationalities. #4. Michael Ojo (216-C-93, college: FSU, currently plays in ABA League) was not able to help Crvena Zvezda in their game against Buducnost (16-6) in the ABA League. He recorded 8 points and grabbed 10 rebounds. The league leader Crvena Zvezda was defeated 84-80 in Podgorica by the lower-ranked Buducnost (#3). Ojo's overall stats this season are: 8.4ppg and 6.4rpg. Worth to mention Ojo played also at Eurobasket Summer League, which helped him get the job in pro basketball. #5. Micheal Eric (210-C-88, college: Temple, currently plays in Turkey) was not able to secure a victory for Darussafaka (20-8) in their last game on Sunday. Despite Eric's good performance Darussafaka was defeated 89-82 at home by the lower-ranked Banvit (#8). He scored 14 points and grabbed 7 rebounds. There are only three games left until the end of the Regular Season. So now every game is very crucial. Eric has reliable stats this season: 13.7ppg, 5.8rpg and 1.2apg. #6. Experienced Kieron Achara (208-F-83, agency: Two Points, college: Duquesne, currently plays in United Kingdom) was the main contributor in a Glasgow Rocks' victory against the ninth-ranked Cheshire Phoenix 86-76 in the British BBL last Sunday. Achara was the best player in that game. He scored 20 points and grabbed 8 rebounds. Achara has reliable stats this season: 11.9ppg, 6.0rpg, 1.5apg, 1.3bpg and 1.1spg. He also holds two passports: Scottish and Nigerian. #7. Ike Joseph Udanoh (203-PF-89, college: Wayne St., MI, currently plays in Italy) couldn't help one of league's weakest teams Sidigas AV in their game against Banco di Srd in the Italian Serie A. Udanoh scored 6 points and grabbed 5 rebounds in 28 minutes. His team was crushed by 21 points 105-84. Udanoh has reliable stats this year: 11.6ppg, 7.6rpg, 3.4apg and 1.3spg in seven games. He holds both American and Nigerian passports. #8. Chukwudiebere Maduabum (206-F-91, currently plays in Japan) couldn't help Yamagata (21-37) in their last game. Despite his very good performance Yamagata (#5) were crushed 104-77 on the opponent's court by the higher-ranked (#4) Fukushima in the East group. Maduabum had a double-double by scoring 19 points and getting 12 rebounds. He also added 2 blocks in 31 minutes. Maduabum's stats this year are: 14.2ppg, 9.4rpg, 1.6apg and 2.6bpg in 52 games. #9. O.D. Anosike (203-F/C-91, agency: Alti Sport, college: Siena, currently plays in France) contributed to a Le Portel's victory against one of league's weakest teams Levallois 83-78 in the French Jeep ELITE ProA in Friday night's game. Anosike scored 16 points and grabbed 6 rebounds in 27 minutes. Anosike's stats this year are: 11.0ppg, 8.0rpg and 2.1apg in 20 games. He holds both American and Nigerian passports. #10. Danny Agbelese (206-F/C-90, also represented by Octagon Europe, college: Hampton, currently plays in Greece) couldn't help Holargos in their game against Lavrio in the Greek A1. Agbelese scored 9 points, had 8 rebounds and made 2 blocks. His team was defeated 76-69. Agbelese's total stats this season are: 8.1ppg, 7.1rpg and 1.9bpg. He holds both American and Nigerian passports.